Do we make the most of the wonderful museums that we have in this country? Many are free and offer us an enormous range of collections to view, films to watch, models to touch, interactive displays, models with buttons to press, and more recently there are interactive digital screens that allow us to walk through a virtual world created by CGI. In the reign of Queen Victoria, some of the most impressive free-to-access museums were created for the benefit of the public and they are still there for us today. How many of us were lucky enough to experience a sense of awe and wonder when we were young and taken to a museum like the Natural History Museum, the Science Museum or the Victoria and Albert Museum in London? In the modern age, where children have access to virtual worlds through computer games and tablets, can museums still provide an experience that will interest and excite young children? Is there more that museums can do to captivate the younger generation and stimulate our next generation of scientists? Making memories and inspiring children. When I was about seven years old, I was lucky; my parents took me to London and we visited the Natural History Museum (NHM). I can still remember how amazed I was when I first saw the huge diplodocus skeleton cast in Hintze Hall, like a monster inside a cathedral. Immediately I was hooked and I was asking questions: how could a creature be so huge? what did it eat? where did it go? why aren’t there any left now? I can imagine my parents delight at having introduced me to the wonderful world of biology and their patience when faced with the impossibility of answering all my questions. Of course, it didn’t matter that they could not give me all the answers at that time. What really mattered was that I was interested, I was thinking and I was asking questions at a young age. This was the beginning of my life-long enjoyment of science. As I grew up I visited other museums: The Science Museum in London, The Railway Museum in York, The Museum of Film and Photography in Bradford. This was in the 1970s and 1980s when digital displays and CGIs did not exist. There were just a few buttons to press on a few mechanical interactive displays which made something move, but most exhibits were ‘show and tell’. Even so, that was enough to make me interested in the world. Static displays of DNA molecules, glass cabinets containing insects, birds and other wonderful creatures were fascinating in themselves. One of my favourite exhibits was a giant live ant colony at Wollaton Hall in Nottingham. I know that I was very lucky. Many of my friends were not taken to museums and school trips were not as adventurous as many are nowadays. Today, I imagine the situation is much the same. Some children, whose parents or schools understand and value the experiences gained from museum visits, will share with me that ‘wow’ feeling when they saw something outside of their imagination for the first time. Other children won’t have that experience. Not all museums are free, travel is expensive, parents work long hours, schools’ can’t afford coach travel. There are many reasons why children might not visit museums today. However, I think that it is important that I was shown the discoveries and possibilities of science when I was still at primary school age because it inspired me to find out more. I thought science was interesting and relevant. It’s probably not a coincidence that many years later, I found myself doing postdoctoral research in biological sciences. Now I am working in primary schools sharing science with the next generation of scientists. What are museums doing to attract us to visit them? Most museums work hard to make the museum experience a good one for children. Curriculum-linked workshops, science shows and self-led activities developed by professional educators are available in many museums. The Natural History Museum even boasts a series of gallery characters such as Mary Anning and Alfred Russell Wallace. These characters share stories with children, taking them on a journey using props and puppets and teaching the children that scientific knowledge can change when new evidence comes to light. It is crucial that museums do map the primary science curriculum because often teachers will only bring children, and parents will only pay for a school trip, if a visit allows some statutory learning objectives to be ‘ticked off’. Many museums also provide children with fantastic opportunities to ‘work scientifically’ (an important area of the primary science curriculum), for example The Earth Science Show at the Natural History Museum. When I was a child, ‘show and tell’ style exhibits were the norm. They are still seen and still have value, simply because children can see objects that they won’t see at home or at school. Personally, I think that a static dinosaur skeleton is more impressive that a moving CGI because it gives you a sense of scale and you have to acknowledge that it is real. However, we now have better digital learning facilities than ever, which can make the learning experience much greater and impressive. 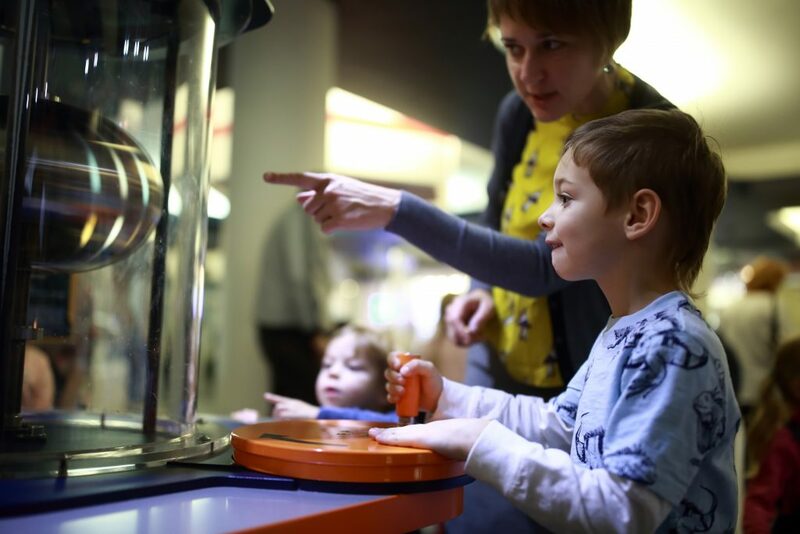 A good interactive display will turn visitors of all ages into explorers (remember ‘working scientifically’ – this is why science and natural history museums do it so well). The cost of computer based technology is falling fast and museums have embraced computerised interactive displays (as well as mechanical interactive displays). Several museums, recognising that it is not always practical for children to visit, offer a selection of online resources that support science teaching and learning at school and at home. ‘We the Curious’, which describes itself as ‘an indoor festival…. where the boundaries are removed between science, art, people and ideas’ is a fantastic place to visit. It also offers a YouTube channel with several films that children can see at school or at home which may spark their imaginations. The National Science Museum in London also has lots of online resources, including for the under 5’s. With such a lot of museums providing children’s activities in ‘real time’ and online, we could assume that museums are doing everything they can to attract new visitors and provide their existing visitors with a good experience. I know myself that I fill in feedback forms when I visit museums and exhibitions (and even National Trust places) so I have assumed that museums reflect on their practice and have a willingness to improve the museum experiences for their visitors. This is great for those who have discovered the benefits and enjoyment of museums for children but how can museums reach the children that don’t visit? At the ASE conference in January 2016, I was interested to hear about a project led by Professor Michael Reiss, Professor of Science Education at Institute of Education, University College London, on the contribution of natural history museums to science education. He suggested that natural history museums could be more proactive in determining which children and schools do not visit. Specifically, museums could match the names of their existing visitors with the national pupil database (NPD) which contains detailed information about pupils in schools and colleges in England. The database also includes information about pupils’ characteristics, such as gender, ethnicity, first language, eligibility for free school meals, special educational needs (SEN) and pupil absence and exclusions. With this information, museums could begin to target schools and children who don’t appear at the museum. This could be an effective way to ensure that all children have an opportunity visit museums and experience the wonder of science in the real world. If some children miss this experience, we might miss creating some of our next generation of scientists. Will science and natural history museums have a role to play in the future as digital learning continues to improve? It is possible that children will experience more of their learning through the internet and a virtual world but I doubt that the excitement that I experienced when I was young and seeing ‘Dippy’ in the Natural history Museum for the first time will be replaced by computers. In fact, the NHM has now sent Dippy on Tour around the UK from spring 2018 to autumn 2020 (details can be found at www.nhm.ac.uk/take-part/dippy-on-tour). The virtual museum is a poor substitute for seeing iconic objects because physicality is important in learning; many people prefer to learn by touching and experiencing. Children especially, enjoy learning by ‘doing’ and the hands-on workshops and mechanical interactive displays in museums provide this. Furthermore, we remember learning when we have enjoyed it because having an emotional response drives the learning into the deeper memory (Bob Jeffrey & Peter Woods, Creative Learning in the Primary School, 2009). As long as museums can provide us with enjoyable experiences, we will learn and we will want to visit. In summary, there are some fabulous museums out there and children deserve to visit them. If you take a child to a good well-designed museum, you never know what enthusiasm for a subject might be ignited in the mind of your child.